is a world class producer of disposable medical devices for the OEM market, and a provider of innovative solutions for specialized flow control needs. Elcam offers an extensive range of products in order to add efficiencies to our customers’ sourcing processes while providing superior customer service. Elcam Medical works with the medical industry’s leading companies, with particular expertise in the areas of Fluid Management, IV Therapy, Vital Sign Monitoring, Hemodialysis, and Drug Delivery. Elcam's Stopcocks and Manifolds are designed for worldwide markets and meet all standards according to ISO 594 and DIN 13090. Elcam's Stopcocks and Manifolds are available in 1,2,3,4 way configurations with various handle styles and colors to match different required application. In addition, the body can be in polycarbonate, polysulfone, antimicrobial, and in lipid resistant material (i.e. Tritan). 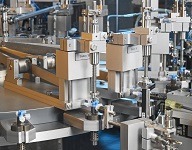 Elcam offers standard and high flow options. Products can be supplied in materials suitable for ETO, Gamma and E-Beam irradiation and/or lipid based admixtures upon request. The Safe2Rotator is a rotator with a spin-lock feature that provides rotational flexibility to the distal part of the stopcock set. This is currently available for standard bore products and will be available for large bore products in the near future. 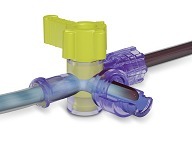 The Safe2 Rotator is easy to use and provides an extra layer of protection in terms of accidental disconnection of medical tubing, including IV or arterial tubing. In addition, tubing kinks and twists as well as connection breakage are minimized. The Safe2 Rotator is CE approved, Premarket notification (510K) was submitted. Elcam Medical strives to provide the building blocks for safer and more effective medical fluid management in acute settings. Elcam Medical widens its Safety Is In The Details™ campaign with new and innovative components. It is a well-established fact that when plastic is exposed to a chemical environment, the material may undergo numerous changes. If the plastic is under stress, it may also experience environmental stress cracking (ESC) , which is defined as the crazing and cracking that may occur when plastic under tensile stress is exposed to aggressive chemicals. 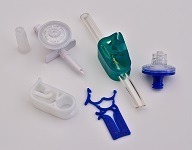 The potential for environmental stress cracking is of paramount concern when plastics are used in medical device components such as luers and stopcocks. In these applications, chemicals such as isopropanol and lipid solutions can initiate crazes—microcracks bridged by polymer fibrils—in the plastic and seriously compromise its mechanical integrity. Such an event can lead to serious patient injury or even death due to several adverse events: medication discontinuation, bleeding, air ingress and air embolism, dehydration, bacteria ingress and consequent blood stream infection. Additionally ESC also jeopardizes medical teams that may come in contact with blood and potentially aggressive drugs leaking from the crazes and cracks. Nowadays there are raw materials that have shown increased durability to ESC and when it comes to safety in medical care, especially when aggressive agents like chemotherapeutics and lipids are involved, it is important to take into consideration the proper selection of the medical plastic. Eastman Tritan™ is a new-generation copolyester that has been shown in laboratory settings to be resistant to a large spectrum of medical fluids such as oncology drugs, lipids, drug carrier solvents, and nutrition which minimizes the risk of cracking and increases patient safety. Tritan™ is also BPA-free, and it is additionally known for its toughness, low residual stresses, and color stability post sterilization. Elcam Medical's new Tritan™ Integrated Stopcocks are already available and Connectors, that will be available in Q3, provide protection to patients and care givers from lipid and drug related connectors' erosion. This new line provides our OEM customers with tools to mitigate lipid and drug related hazards during fluid administration. It will also enable Elcam to offer a BPA-free line of components for customers who are concerned with emerging legislation. Luer connector misconnections are an under-recognized but common dangerous events. The objective of the new ISO 80369 Standards that are gradually being implemented is to prevent these adverse events so crucial to patient safety. Elcam Medical has taken a proactive approach to the implementation of the new ISO 80369 standard regulations and is in the process of implementing those standard drafts well in advance allowing our customers to prepare themselves for the upcoming change. 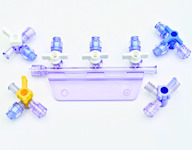 Elcam Medical has launched a new Enteral Feeding Stopcock that includes the Enfit connector design that fully complies with the new standard. Among relevant devices that will be affected by this new standard are epidural devices, pain pumps, and their administration sets, regional anesthesia catheters, and needles. 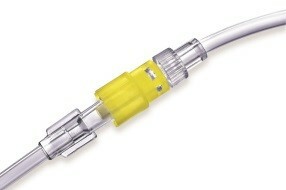 This line of connectors will include both male and female versions and also vented and non-vented caps for both connectors. The connectors will be made of the clear Tritan™ material from Eastman, which was shown in laboratory tests to have improved lipid resistance, high clarity, and the BPA-free benefit. Elcam intends to launch an ISO 80369-6 2016 male Safe2Rotate (S2R) version of connectors for minimizing disconnections and providing another safety layer for neuraxil fluid administration. 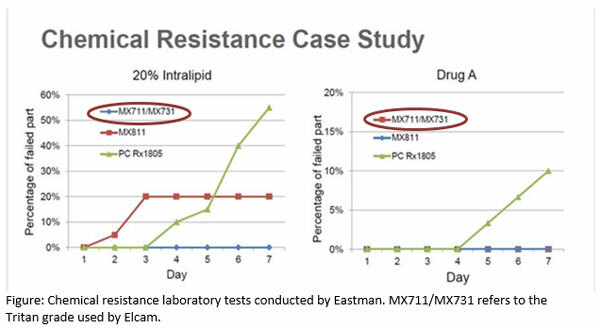 The Elcam ISO/FDIS 80369-7 Connectors will also address the need of drug resistance connectivity by cooperating with Eastman in implementing the well-known Tritan™ material with its properties of oncology drugs and lipid resistance and chemical compatibility and durability. Recently, the breathing systems connectors’ standard has been removed by the ISO organization; however, its final destiny is still ambiguous. Nonetheless, Elcam has started developing connectors that will comply with this standard as part of its Patient Safety Roadmap. During 2017, Elcam launch a series of connectors which comply with ISO/DIS 80369-2. Elcam is the OEM market leader for stopcock worldwide because we continue to innovate and offer products our customers need. For example, the Elcam Minimal Residual Volume Luer Activated Swabbable (MARVELOUS) is a closed stopcock with a proprietary flow channel feature, allowing your customers to automatically flush drugs and blood residuals, without the need to expose the system to the open air, and assuring minimal residual volume. This is an example of offering products addressing the clinical needs of your customers. Elcam Medical offers its expertise in supplying stopcocks as cost effective sub-assemblies. Elcam can bond your specified tubing to one of our stopcocks using either hand or automated processes.We utilize both solvent and UV bonding methods. Stopcock can also be provided with Tube fitment - A Stopcock having either its male or female port designed to accept a tube bond tubing pocket. Available in a variety of dimensions. Is the brand enhancing Elcam’s leadership and focus in the stopcock line of products. Our stopcocks can be customized to meet your specific needs, and they are delivered with the unique Elcam customer experience. Is the Elcam brand for sourcing your everyday needs in medical control applications for IV therapy, anesthesia, patient monitoring, and hemodialysis. This Elcam brand offers a wide range of devices whether it is a drip chamber, an IV filter, or a simple clamp. Elcam Components offers these products in any size and quantity with excellent customer service. Continuous Pressure Monitoring, is a mission-critical application. Here you cannot allow your product, whether an Arterial Line, Central Venous Pressure line, or other pressure monitoring products, to fail. Elcam's DIPT, is the first and only fully integrated pressure transducer. This integration provides you with the reliability and robustness no other transducer can provide, along with the space saving and ease of use so much needed in Intensive Care Units and Operating Rooms. As in many of Elcam's products, Elcam's DIPT is also adaptable in dimensions such as tube fitments and cables connectors, to perfectly meet your requirements. Sometimes you have an application where you need to maintain a very low flow. It might be keeping the vein open, or maybe you are producing your own Pressure Transducer and you are looking for a stand-alone flush device as a complimentary to your product line. Leveraged by Elcam's years of experience in pressure monitoring, Elcam's flush Device is just the right solution for such applications. It allows you to be competitive and flexible, exactly where you need to be. The product has a new ergonomically designed ErgoNess High Pressure (HP) handle with a high profile and finger-contoured arm grip to facilitate smooth and comfortable rotation. The rounded edges of the handle protect the physician’s gloves and allow maximum efficiency. The product is available in 1 and 3 way configurations with a HP rotator or a standard swivel luer lock nut. The 3-way stopcocks are available with "ON" and "OFF" handles. A Medium Pressure Stopcock with 500 psi durability allowing a cost effective solution with your exact pressure requirements for interventional products. Elcam’s High Pressure Manifolds are designed to withstand 800 psi pressure and include our newly designed ergonomic handles that improve ease of use and convenience. It is available with 2 or 3 gangs with HP rotators. Elcam’s Y-Click audible-click design offers a true one-handed, ergonomic hemostasis-Y that withstands pressures up to 600 psi, one of the highest pressure ratings of these types of devices. Y-Click also offers a self-closing mechanism to ensure minimization of blood loss during the procedure. H-Flow is ideal for angiographic catheters requiring hemostatic flow control products for safe handling of guidewires. H-Flow Valve is a luer activated self-sealing device that can withstand pressures up to 1200 psi. Elcam is an innovative customer-centric, full-service partner with capabilities ranging from design through manufacturing with particular expertise in high volume precision molding, high speed assembly and laser applications. 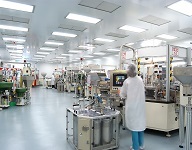 Our customers include large to small medical device and pharmaceutical companies worldwide. For over 40 years, Elcam consistently provides high quality products at competitive prices and delivered on time. Elcam maintains its leadership position by continuing to innovate and work closely with its partners. For more information contact Elcam Medical, Inc.